June The temperature is now too hot for the fox to stay underground. Pups and adult fox abandon flea-infested breeding earths and rest above ground in thickets. The pups do not stray far from their parents, but begin to catch bugs and mice on their own. The corn fields are planted and grow rapidly. Young rabbits and groundhogs, as well as ground-nesting birds, represent a bonanza food-source. July Young adolescent cubs lie above ground and hunt with their parents. The young fox are gaining weight rapidly. Insect, bird and rodent populations rise. 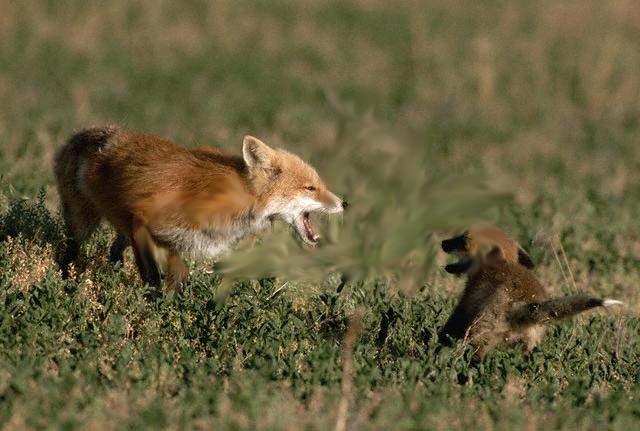 The young fox begin to hunt on their own. As the corn reaches four feet, adult and adolescent fox move into the center of the fields where they can rest in the cool shade during the day. Berries, mice, rats, frogs, snakes, young rabbits, baby groundhogs, and corn provide ready food. August The cubs are now catching food on their own, and they are sleeping apart from the adults. 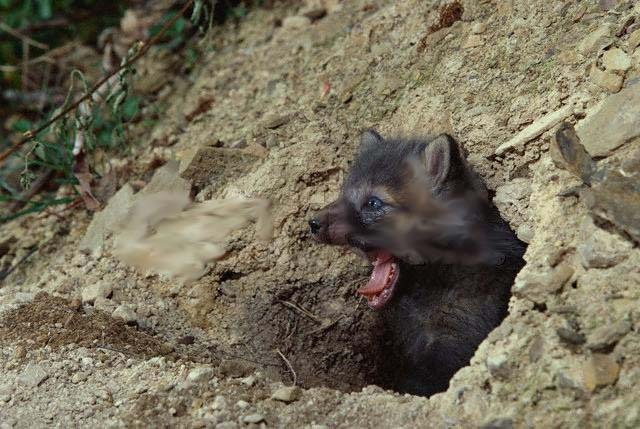 Adolescent fox remain in their parent's territories. 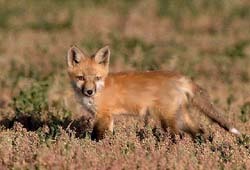 Fox are rarely seen during the day, and generally leave the shade of the corn fields only in the evening. Mice and rat populations are the main food source, along with grasshoppers, fruit, corn, and scavenged roadkill. very beginning of fox season Adults and sub-adults look very similar. Sub-adults may spar, and siblings may be spotted near each other, but they are now totally independent from their parents. The first corn fields are cut, but fox remain above ground as it is too hot. October Male foxes strike out on their own. Young males may travel considerable distances to secure their own territories. The corn has now been cut off the fields, and the fox are jungling up in the thickets again. It is still warm, and very few fox are denning. Evenings are cool, however, and winter coats start to come in. Food is plentiful as end-of-season berries and crops mature. November Young adults take over the territories of dead or weak parents. Several young females may reside in a dominant male's territory, but typically only one female will mate. The last corn is off the fields, and the last hay is cut. December Foxes defend their territories as the mating season approaches. Hormones rise, and females excavate and clean out old groundhog dens. New excavations in fields and hedgerows are a likely sign of fox, as most groundhogs are already prepared for winter. Fox dens will begin to smell slightly skunky. Pairs of fox will often be bolted out of the earth at this time. Many farms plow under their corn stalks. January The mating season is in full-swing, with male and female fox on the prowl. Dens will have a slightly "skunky" smell due to hormones in the urine of the vixen. Fox will pair up and remain paired for the next five months. This is one of the best months for terrier work, especially during inclement weather. February Dog foxes and vixens begin to settle down. The vixens will chose a breeding earth in which to whelp. February is a prime month for terrier work, as the dens are settled but the pups are not yet in residence. Fox are most likely to be home after a night of ice, snow or freezing rain, or when the wind is blowing. fox season The cubs are born after a 53-day pregnancy. Their coats are dark gray -- almost black. The vixen generally stays to ground except to defecate. 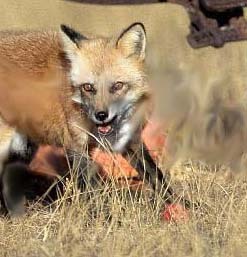 Food for the vixen is brought by the dog fox, who is sometimes aided by adolescent females from last year's litter. The cubs will start to toddle out of the earth, but they will not go very far afield. The dark coats of the pups are now beginning to turn a faint reddish-brown. 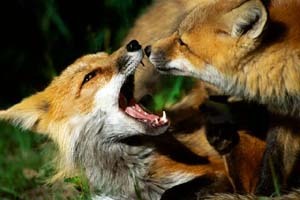 The adult fox will begin to bring mice, voles, and moles to the den for the cubs to play with. The cubs are beginning to look like adults, and they are beginning to show some independence. This is a period of rapid learning through aggressive play. The pups spend a lot of time toying with mice and other small carcasses brought to them by adults.